We Plan. You Play. 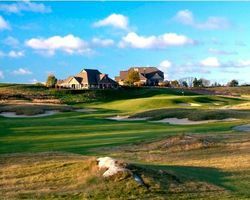 Golf vacation packages to New Jersey. Take advantage of our deals, discounts, the best planning advice, or create your own stay / play package. Nestled in the fascinating Kittatinny Mountains of New Jersey, just 47 miles away from Manhattan, is the eminent setting of an acclaimed mountain golf destination. Known for providing the most golfability and accessibility in Northern New Jersey, as all four championship courses are accessibly within a five-mile radius around Hamburg. Each hole of masterfully sculpted layouts represents a distinct character that marks a designer's ingenuity from distinguished architects like Rulewich, Jones, Fazio and Hagge. Matched with a golf academy and PGA-certified instructors, Crystal Springs Resort renders tour quality greens and well groomed fairways. Whether it's for the test of skill or just a whimsical round, you are sure to have a place in a pleasing golf environment obviously different from the rest. Have a truly complete vacation in a four-season resort that features 12 diverse restaurants, cafes and bistros with a combination of exciting cuisines, acclaimed spas, indoor and outdoor heated nature pools, exciting parks and enjoy a peaceful yet cheerful sundown in their Restaurant Latour where an extensive wine list awaits every golfer's taste. Escape to the highest peak and discover the Crystal Springs Resort.